Millions of technology enthusiasts were glued to their screen last September as Intel officially announced their upcoming 8th gen Coffee Lake processors, which many pundits expect to take the world by storm this year. This is due to the fact that the Coffee Lake desktop processors will likely offer a significant bump in performance without a dramatic price increase, meaning many gamers are looking forward to upgrading to Intel’s latest tech this year. And without further ado, here follow the top things to know about Intel’s new processor launch. When will Coffee Lake processors be available in stores? During its presentation in September, Intel announced its 8th gen processors for desktops (the “socketed” variety) would be hitting the retail channel later this year. Specifically, the Santa Clara company said these would begin shipping to wholesalers on October 5. This means it won’t be long after that before they become available for purchase via online retailers. Additionally, OEM systems based on these CPUs will become available later in 2017. What is the launch price? Intel announced six new-gen CPUs for launch this year, listing prices for these. The table below shows pricing and specs for the new Coffee Lake processors. These are the Coffee Lake desktop processors hitting shelves this October. 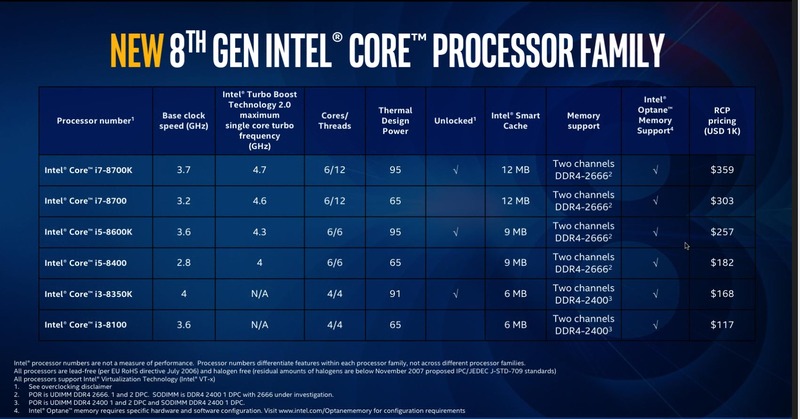 Looking at this table, it is easy to see that Intel hasn’t bumped up prices dramatically with its 8th gen CPUs. Actually, these recommended customer prices are almost identical to those of its 7th gen processors, except the i5-8600K, which is priced at $257 vs $242 for the current i5-7600K. Also, the i7-8700K has a higher recommended price than its 7th gen counterpart the i7-7700K. However, as we’ll discuss below, the tech giant might be delivering a once in a decade performance upgrade with their 8th gen CPU offerings. How do 8th gen Coffee Lake processors differ from the previous gen? Looking at Intel’s new line-up, the first thing one notices about the new Coffee Lake processors is the increased number of cores. This means that the new i3s are now four core parts, i5s now boast six cores, while the new i7 offerings are six core CPUs too, but with multi-threading. And these CPUs could be offering the biggest performance bump from Intel in years according to benchmarks which emerged online last summer. Actually, the new Core i7-8700K (which Intel is calling its “best desktop gaming processor ever”) outperforms its 7th gen Skylake counterpart (the Core i7-7700K) by almost 50 % in the “processor multimedia” test of popular benchmark suite Sandra, according to a leaked benchmark. The new i7-8700K is one hell of a gaming processor according to Intel. 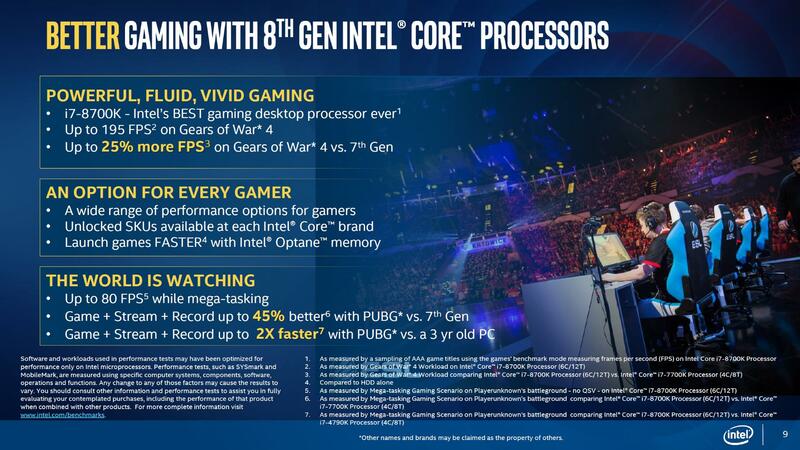 Intel’s own performance figures also reveal how powerful the new Core i7-8700K will be when running video games, citing a 25 % increase in frame rate in Gears of War 4, which is no mean feat. Also, the new six core part, the Core i5-8400 (which will replace the Core i5-7400 processor), will likely be quite the performer, with leaked benchmarks revealing that it will offer performance comparable to a Core i5-7600K. The new Core i3-8350K will also be a speed demon apparently, with early benchmarks suggesting it could even rival the previous gen’s top of the line i7-7700K in single core tasks.